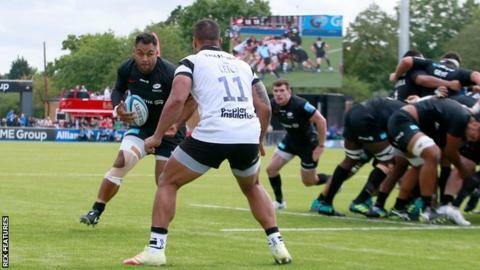 England number eight Billy Vunipola scored a try on his latest return from injury as Premiership champions Saracens recovered from a surprise half-time deficit to beat Bristol Bears. Vunipola, back after breaking his arm against South Africa in June, forced his way over from behind a Sarries scrum having come on with 35 minutes to go. The impressive Bears had led by five points at the break, with two Alapati Leiua tries cancelling out Matt Gallagher's opener. Alex Lewington touched down to make it 18-18 - but the game turned when George Smith was shown a red card for a dangerous tackle to leave Bristol down to 14 men. Vunipola put the hosts in front shortly after, before Wales back Liam Williams scored a 25-minute hat-trick to seal a comfortable bonus-point victory. But Bears head coach Pat Lam will have been encouraged by his team, who even registered a third try of their own through Nick Haining. Having opened up their campaign with victory over Bath at Ashton Gate, Bristol competed well against the four-time winners and deservedly led at half-time. But Sarries came out with renewed vigour after the break and former Australia forward Smith's red card paved the way for a dominant final half-hour. Williams dotted down with his first touch after coming on as a replacement and added two further scores to complete a second-half treble. "It was good to get Billy back and he looked OK. His arm is fixed and he will only get better the more he plays now. "He hasn't played a lot of rugby over the last 18 months and hopefully he can get some consistent game time. "We were disappointed with our first-half performance. They did a brilliant job on us at the breakdown. We weren't aggressive or urgent enough. "To give the players some credit our second-half performance was way better, albeit against 14 men. But for us that performance isn't good enough. We need to be better." "If you put it into context of other decisions, I don't think it's [George Smith's red card] any more than a yellow card. "It's certainly a penalty - without a doubt. A yellow card? Possibly. It needs to be clear and obvious but the number of replays they used suggested it wasn't clear and obvious. "When you come to the champions and play on that pitch, playing with 14 men is always going to be very difficult. We were right in the game at that stage. "We chased the win, even with 10 minutes to go. We were hunting for the bonus point right until the end. We came up short, but not for the want of trying." Saracens: Goode; Gallagher, Lozowski, Barritt (capt), Lewington; Farrell, Spencer; M Vunipola, George, Koch, Itoje, Isiekwe, Rhodes, Wray, Vailanu. Replacements: Tolofua, Barrington, Lamositele, Skelton, B Vunipola, Wigglesworth, Tompkins, Williams. Bristol Bears: O'Conor; Morahan, Hurrell, S Piutau, Leiua; Sheedy, Uren; Lay, Thacker, Thiede, Holmes, Latta, Luatua (capt), Smith, Lam. Replacements: Malton, Woolmore, Afoa, Joyce, Haining, Randall, Madigan, Pincus.